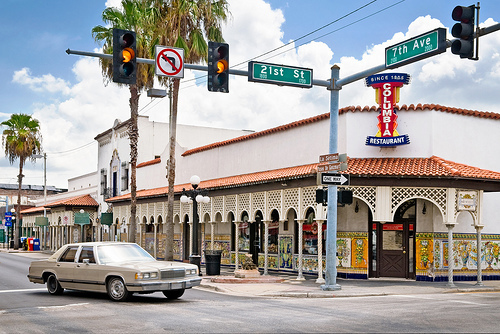 Hey everyone ~ Jessica here with some exciting news from your favorite Ybor City restaraunt... the Columbia will be rolling back prices on Sunday, September 20th for "1905 Day." September 20th, marks the 104th Anniversary of the fourth and fifth generation family-owned business. For one day only, the Columbia restaraunt in Tampa&apos;s Ybor City, will be open from noon until 7:00pm on "1905" Day offering guests world-famous Spanish cuisine for the prices you might have paid in the "good ole days." "&apos;1905&apos; Day is Columbia&apos;s way of thanking diners who have contributed to the success of the Columbia for over 100 years and five generations of ownership," said Richard Gonzmart, president of the Columbia Restaraunt Group. On this day only, reservations are not accepted, and take-out items are not available. The Columbia restaraunt is where Tampa Bay entertainment and Tampa Bay dining come together in a traditional Spanish atmosphere. The Columbia was founded in 1905 and is Florida&apos;s oldest restaraunt. This Tampa Bay events only on for one day, so don&apos;t miss this chance to enjoy great food in historic Ybor City! Call your friends & family and join the Columbia on September 20th!! !